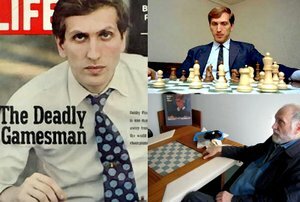 For people interested in the late Bobby Fischer, an enthusiast has put together every public video featuring or about Fischer. A real labor of love, and there are many fascinating items there. 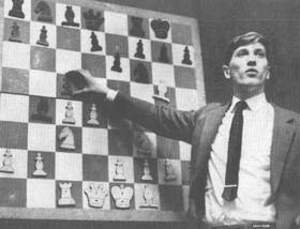 News services round the world have been reporting the untimely death of Bobby Fischer, a.k.a. Robert James Fischer, the American-born chess genius. Fischer’s match with Boris Spassky in 1972 had a huge influence on me, tempting me back to competitive chess, and over the years I studied most of his games in great detail. So I was definitely a fan. But sadly much of the coverage has focused on some of the foul things that he said in his later years. It is particularly unfortunate because most of the reports failed to mention a number of other things about him. I never met or examined Fischer and it is dangerous to diagnose people at long range. But there were multiple reports that made it very clear that he long ago crossed the line into mental illness. He was always single-minded and cantankerous, and some of his allegations about cheating turned out to be correct. But when he began to believe that people could pick up or manipulate his thoughts through the fillings in his teeth, it was clear that something else was going wrong with him. Some people have tried to link genius in chess and mental illness, but the link is at best tenuous, even though more than one very strong player has succumbed to mental illness. As we have discussed, there may be a link between creativity and schizotypal personality disorder, but the thing about chess is that high-level play requires enormous sustained concentration and motivation, to say nothing of the ability to withstand intensive mental stress. Thos are all things that become difficult as mental illness progresses. One of the best ways of evaluating a culture is the way in which it treats its weakest members. So let us remember and celebrate Fischer’s genius and recognize that his later and ever darker life was driven by a terrible mental deterioration. Every young neuroscience student learns about a classic experiment that was published in 1956 by Raul Hernandez-Peon, in which he had an electrode in the acoustic nerve of a cat, while a metronome was ticking. Every tick caused a pulse of electricity in the nerve. But as soon as the cat saw or smelled a mouse, the electrical activity plummeted: now all of his attention was on lunch, and his brain damped down the unnecessary ticking of the metronome. Something similar happens with the “Cocktail Party Phenomenon:” our ability to focus our listening attention on a single talker and ignoring other conversations that are going on. A study by researchers from Wake Forest University Baptist Medical Center and the University of North Carolina was presented at the Society for Neuroscience conference in San Diego this week, suggesting that our brains can turn down our ability to see, so that we are better able to listen and focus on music and complex sounds. The research used functional Magnetic Resonance Imaging in 20 non-musicians and 20 musical conductors aged 28-40, and found that both groups diverted brain activity away from visual areas during listening tasks. The activity fell in the visual regions areas as it rose in auditory ones. But during harder tasks the changes were less marked for conductors than for non-musicians. While being scanned the subjects were asked to listen to two different musical tones played a few thousandths of a second apart and identify which was played first. 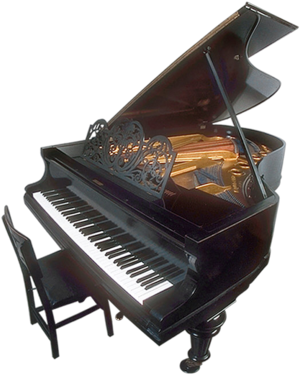 The task was made harder for the professional musicians than for the non-musicians, to allow for the differences in their background. As the task was made progressively more difficult, the non-musicians carried on diverting more and more activity away from the visual parts of the brain to the auditory, as they struggled to concentrate on the music. However, the conductors did not suppress their brains, suggesting that their years of training had given them an advantage in the way that their brains were organized and functioning. They are less likely to be distracted and are highly tuned to musical sounds. This is like closing your eyes to listen to music and the advantage of the trained musicians is similar to the advantage that we see in the brain of the chess master compared with the amateur. 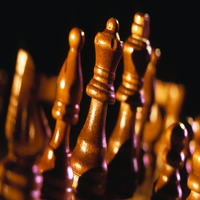 Years of study and practice enable the chess player to move without much conscious thought. It shows how well we are able to divert activity from one part of the brain to another as needed. It is that ability to be flexible and to recruit more brain when we need it that lies at the heart of the neurocognitive revolution that is changing the way that we think about the brain and mind. Your humble reporter has always had a good memory for faces. A month after a meeting in San Antonio at which we had about 250 attendees, he was in another part of the country when a charming man came over to say, "You won't remember me, but I was at your lecture in Texas last month." He looked like a man who'd eaten a raw egg when he got the response, "Oh yes, fifth row from the back, fourth person along." It would be great if that memory for faces could be linked to a memory for names or something else useful. But sad to say it isn't. Just the face, and when and where it was last seen. But new research in neuroscience has shown us ways to tether other memories to each other. So it was interesting to see a new report of some fascinating research from Vanderbilt University in Nashville suggesting that it is common for us to be better able to remember faces than other objects and in addition that faces “stick” the best in our short-term memory. The reason may be that our expertise in remembering faces allows us to package them better for memory, since faces are complex and their recognition is also essential for normal social relationships. The findings are currently in press at the journal Psychonomic Bulletin and Review. The key component of the research is visual short-term memory or VSTM has a unique way of being coded in the brain. The findings have practical implications for the way we use our memories. Clearly being able to store more faces in VSTM may be very useful in complex social situations. Just think for a moment how much most people like being remembered, particularly if you can attach a name and salient fact to the memory. Most of the successful business people and politicians that I know are remarkably adept at doing this. Short-term memory is crucial to the way in which we create impressions and adapt to a continuously changing world. It serves as temporary storage for information that we are currently using: rather like the RAM on a computer. For example, in order to understand this sentence, your short-term memory will need to remember the words at the beginning while you read through to the end. People with some neurological and attentional problems have a real problem with doing that. VSTM is a component of short-term memory that helps us process and briefly remember images and objects, rather than words and sounds. VSTM allows us to remember objects for a few seconds, but as with working memory and all the short-term memory stores, its capacity is limited. The new research focuses on whether we can store more faces than other objects in VSTM and the possible mechanisms underlying this advantage. Study participants were asked to look at up to five faces on a screen for varying lengths of time (up to four seconds). A single face was later presented and the subjects had to decide if this face was part of the original display. For a comparison, the process was repeated with other objects, like watches or cars. The researchers found that when participants studied the displays for only a brief amount of time (half a second), they could store fewer faces than objects in VSTM. They think that this is because faces are more complex than watches or cars and therefore they require more time to be encoded. Surprisingly, when participants were given more time to encode the images (four seconds), an advantage for faces over objects emerged. 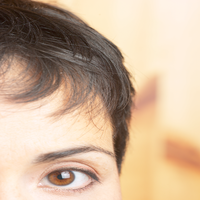 The researchers believe that our past experience with learning faces explains this advantage. This theory is supported by the fact that the advantage was only observed if the faces were upright: the most familiar orientation. Faces that were shown - and therefore encoded - upside-down showed no advantage over other objects. This is very similar to the situation in chess, where, compared with a novice, a master can instantly remember a position on the board if the pieces are in logical places. If they are arranged at random, the master does no better than the rank amateur. Most of the textbooks tell us that the capacity of short-term memory is something is fixed, and that you either have a decent capacity or you do not. However the research indicates that you can learn to improve your capacity for this form of memory. This makes sense: as a child your reporter rarely made notes and his parents supported him in that. More than one school teacher thought him lazy and inattentive because his note books consisted of doodles and random scribbles in between pages of homework. How many other children have also been accused of cheating or faced punishment or ridicule simply because they had a good memory, but did not learn in the same way as the other kids? We already have some methods for training people to get better at using visual memory, but most have been discovered by trial and error. This new research will make it that much easier to devise memory training methods rooted in brain science. But also remember something else: sometimes forgetting is as important as remembering. For anyone with even a passing interest in chess, a re-unification match for the World Championship is currently taking place in Elista, the capital city of Kalmykia, a small region of the Russian Federation that is Europe’s only Buddhist country. Though I’m sure that some would quibble about whether it should be in Europe or Asia. The beginning of the match between two of the world’s top Grandmasters - the aggressive Bulgarian gambler Veselin Topalov and the conservative Russian, Vladimir Kramnik - has led to and 2-0 score in favor of the Russian. So why am I mentioning this is a blog dedicated to Personal Growth, Healing and Wellness? Because the current one-sided score line has a lot to do with each of these topics. This match is not just about chess playing ability: it is also about psychological and emotional strength, character and resilience. There was a time when chess masters were unfit, often over-weight and the majority smoked. When I first started playing in tournaments in England, it was quite normal to have ashtrays beside most of the boards. Very few players smoke, not just because of long-term health risk, but because the deleterious effects of lowered oxygen levels on cognition outweigh the short-term improvement in attention caused by nicotine. Aerobic exercise is essential to ensure that the brain is perfused with oxygen, and if you are physically unfit you cannot expect to survive a number of games that may each last for five or six hours. Strength training is also essential to overall fitness and physical and the maintenance of psychological resilience. Topalov is going to need that now. Posture is extremely important. According to Chinese and Ayurvedic physicians and chiropractors, bad posture results in a restriction in the flow of Qi, Prana, or blood. Whether or not you believe in the flow of Qi in the body, it is easy to demonstrate that bad posture has bad effects on cognition. Flexibility is also an essential part of physical wellness that affects you psychologically as well as physically. Daily stretching should be part of everyone’s life. Relaxation and meditation: one or other or both are essential tools for maintaining your balance while under stress, and for building resilience. Diet: a carefully balanced nutritious diet rich in omega-3 fatty acids (without any added mercury!) and fiber is essential for optimum mental functioning. Fluid intake: the current recommendations are for a healthy person to drink between 80 and 120 fluid ounces of pure water each day. Avoid alcohol: A former World Champion – Alexander Alekhine – lost his title after turning up drunk on a number of occasions during a match to defend his title. Looking at the pictures from the match, in both games Topalov looked intense and Kramnik far more relaxed. It could have been an illusion: I would need to be in proximity to be sure. In the first game Topalov took a needless risk in a dead level position. In the second, he had an absolutely won game. I’m no grandmaster, but even I spotted a win in three moves. How could he have failed to find it and then lost? What is the explanation? Chess players have to play a certain number of moves in a specified time, so not only are they playing their opponent, they are also playing against the clock. The biggest prize in the game is on the line, for which both players have been preparing since childhood. And there are hundreds of thousands of people who are watching and analyzing their every move. I know from personal experience that it can be hard enough to be interviewed on a television show being watched by millions of people, where any false statement would haunt me forever. Imagine having a battle of wits with one of the finest chess players in the world in the knowledge that every move will be analyzed for the next century, and computers are already analyzing every permutation of every move that the two players have made. The stress on the players is unbelievable. Both have prepared for it, but it is also a matter of who has prepared best: that is a mixture of temperament and training. Just today I read an article talking about ways of avoiding stress. This is silly: stress is part of life and it can provide the motor in motivation. The trick is how we learn to respond to stress. There is also another stressor that has only been felt by world championship contenders on two or three previous occasions. This match is being played in the shadow of the retirement of Garry Kasparov, who, in the opinion of most people, is the strongest player who ever lived, with the possible exception of Bobby Fischer. The difference is that Bobby became World Champion all by himself, with little help and by inventing a new approach to chess. It is a great tragedy that his life has apparently been blighted by mental illness, and that he has played only a few recorded games in the last 34 years. By contrast, Garry was the strongest player in the world for twenty years, and in the opinion of most experts would probably still beat both of the current contenders. So whoever wins wants to prove himself a worthy champion. Garry’s specter remains like the ghost of Banquo in the Scottish play. The final essential is that both players have to detach from the results of the first two games. Kramnik will obviously have his tail up now, but he is too smart and too experienced to give in to complacency. Topalov has to completely forget about the first two games and focus on what lies ahead: I’m sure that he has someone on his team working on simple techniques to stop the past from populating his psychological present. Whatever lies ahead for these two men in the next few weeks, we shall see that chess is a microcosm of life in general. I’ve recently had cause to look at the published literature on child prodigies and there’s not much there. It is very surprising that such an interesting subject has been so little researched. First a definition from a paper by David Feldman: A “prodigy was a child (typically younger than 10 years old) who is performing at the level of a highly trained adult in a very demanding field of endeavor.” There are three fields in which high-level creative results have been produced before the age of 10: Chess, Mathematics and Music. There are other fields such as art and writing in which young people may be precocious imitators. Pablo Picasso exactly mimicked his father’s drawings. There is an impressive list of child prodigies in other fields as well, but it seems that only in chess, mathematics and music have profound, original insights been contributed by preadolescent children. There is an interesting association between mathematics and chess: many top chess players are also extremely good at mathematics. In a previous post I mentioned the English Grandmaster John Nunn, and there are many other examples. Men dominate both fields, but that does not necessarily mean that there is a natural gender difference. There’s a very interesting book entitled Breaking Through, by the chess Grandmaster Susan Polgar who was herself a prodigy, as were both of her sisters. Girls have been excluded from many of these events, or they’ve been forced to play only against girls or women. I know a young person who as a pre-teenager wanted to join the school chess club, but only went once, after discovering that all the other members were boys. A shame: she was already quite a strong player. In the book The Exceptional Brain, Lee Cranberg and Marty Albert suggested that these “localized synapses” lie in the right hemisphere of the brain, which is primarily involved in non-verbal visuospatial skills and pattern recognition. They also suggested that gender differences in proficiency in chess support the right hemisphere idea. But after reading Susan Polgar’s book, and spending a great deal of time analyzing the world literature on gender differences in cognition, that last point doesn’t convince me. It is striking that three of the code breakers at Bletchley Park during the second World War, were outstanding international chess players Stuart Milner-Barry, Harry Golombek and Hugh Alexander. These code breakers who helped win the War also utilized similar skills to those needed to master a chess position or to calculate a mathematical problem. Reasonably high but not necessarily exceptionally high IQ: some people with astronomically high levels of intelligence have had problems with interpersonal adjustment, unless very carefully nurtured as children. Sustained effort to achieve the highest levels in their field: even chess prodigies need thousands of hours of practice, and mathematical prodigies need to work at their field. Adults who want to improve in chess are constantly told to practice as much as possible, and to work on pattern recognition and problem solving. It is just the same in music and mathematics. Although child prodigies may simply have better neurological equipment, usually coupled with extraordinary encouragement by their parents, I am left with a question that I posed in an earlier post. Mozart often said that when he was composing he felt as if he was taking dictation from God. That he was not the one composing, but that he was in effect picking something up from the Universe. I’ve seen countless highly gifted people tell me that their greatest insights in science, music philosophy or chess just “came to them.” The former chess World Champion Tigran Petrosian once said that he could tell when he was out of form when his calculations did not confirm the validity of his first impressions. All this implies unconscious processing to be sure, but I am not sure that it is all in the brain. Because there is another phenomenon that has also not been much researched, and that is the phenomenon of simultaneous breakthroughs: two or more people in different parts of the world coming up with new creative solutions at the same time and without any personal contact. I shall have more to say about this in another post, but it speaks to the fundamental interconnectedness of all of us. Maybe the child prodigies not only have special brains and special parents, but they also have access to a store of information not available to everyone. At least not yet: We already have training methods that help people access accurate information that they did not know consciously. A story for another day. In 1988 the Dustin Hoffman won the Academy Award for Best Actor for his portrayal of Raymond Babbit in the movie Rainman. The character was actually inspired by a real person named Kim Peek. Now in his mid-fifties, Kim has memorized more than 11,000 books, and can read a page of any book in about ten seconds. It has recently been discovered that each of his eyes can read a separate page simultaneously, absorbing every word. He can also do instant calculations on things related to the calendar and several other very specialized topics. He and his brain has been studied in great detail by a Dr. Darold Treffert at University of Wisconsin Medical School. It is quite different from the rest of the population. He does not have the great bridge – the corpus callosum - that connects the two hemispheres in most people. Instead he just has one solid hemisphere. The right cerebellum is in several pieces. None of this really explains his abilities, though perhaps having no corpus callosum means that the right side of his brain is freed from dominance by the left. Darold Treffert makes a good point when ha says that Kim’s father is partly responsible for his brilliance: his belief in his son and his unconditional love for him may have more to do with bringing forth his remarkable skills than the wiring of his brain. There have been many other cases of savants who had remarkable and seemingly effortless abilities. For years now I’ve collected reports about some of them. Srinivasa Ramanujan who complied over 3000 mathematical theorems in less than four years. Vito Magniamele who at the age of 10 could compute almost instantly the square root of any large number. Then there was a six-year-old child named Benjamin Blythe, who while out walking with his father in 1826, asked, “What time is it?” After being told, he gave – accurately - the exact number of seconds that he had been alive, including the two leap years. In one of his books, Oliver Sachs, describes a pair of twins in a psychiatric hospital who are said to have below “normal” intelligence, but who amuse themselves by swapping enormous prime numbers. Even the English chess grandmaster John Nunn reported how, as a child, he could do instant calculations in his head. And, at the age of fifteen, he became the youngest undergraduate at Oxford University in 300 years. Most strong chess masters will "know" where to put the pieces, but then come up with the logical reasons later on. These abilities: to read and memorize, to do instant calculations and to have instant deep knowledge of topics is remarkably interesting and important for all of us. If complex mathematics can be done by people who have no training or intellectual sophistication, what other gifts and talents may we have lying undiscovered within us? These observations lead to the questions; first, can anyone do the same feats as Kim Peek? Second, where does instant mathematical information come from? Third, can anyone access it? And fourth, is this similar to the way that shamans and Babylonian mathematicians obtained their information? In Healing, Meaning and Purpose we learn that there is powerful evidence to suggest that we do have access to a whole seam of knowledge about the world around us. The anthropologist Jeremy Narby studied shamans in the Amazonian rainforest who have found safe and effective herbal treatments among the 80,000 plants available to them. They are usually used in combinations, and to have tested all the plants and all the possible combinations would have taken hundreds of thousands of years. So it cannot have been done by trial and error. I have seen something similar in traditional Chinese herbal medicine, where combinations are invariably used, and once again, if the effective ones had been discovered by trial and error, it would have taken armies of physicians working for countless thousands of years. I don’t expect everyone to be able to become lightning calculators. Neither would most us want to be. But there are a number of ways of getting much better at tapping this intuitive knowing. It is important to tap your intuition and to use it as the ally of your reasoning. Visualize a place that you really like that you can return to at will. I learned this trick from a shaman, and it’s immensely useful. You might remember, visualize or create a space for yourself. For instance you might like to imagine going to a beach that you like. Ask a question: remember that the quality of your answers is dependent on the quality of your questions. So be precise and be calm when you ask you question. I just got an email question about how to differentiate between an impulse and an intuition. The answer to that is your response: an impulse impels you to immediate action, an intuition gives you time to reflect and to thank the Universe for what you’ve just been told. I was just expecting to learn something about what's been going on in the world today, when I came across this excellent blog item by Chess Grandmaster Susan Polgar. Just have a look at this extraordinary video. What amazed me just as much as the video, was that one of the commentators on Susan's blog defended the action of the adult, on the grounds that the assaulted child had played a foul, saying, "As a parent, how easy would you find it to stand by if that happened to your kid?" The answer to that should be, "Very easy indeed." Adults are supposed to have some modicum of self-control. Adults also have a responsibility to model good behavior, not just for their own children, but for all other children as well. It reminded me of the quotation: "If you can't be a good example, then you'll just have to be a horrible warning." I've been involved in competitive games for most of my life, and of course they can inflame emotions. But it is how we act on those emotions that matters. I used to have an excellent chess coach named Craig Jones. He has done a lot for scholastic chess, and I remember being horrified by the antics of some parents at chess tournaments. Those scenes from the movie Searching for Bobby Fischer are not an exaggeration. Being a victim of your emotions is bad enough. Being a lousy role model is the worst kind of irresponsibility. I actually prefer another term to "role models." I call them heroes. And the opposite of a hero is, I suppose, a villain. Just before I entered a Web-free zone, I was looking at Susan Polgar’s chess blog, where she had written a set of answers as to why she should spend so much time and effort on writing blogs. Susan is a legendary chess payer: the first woman to become a men’s International Chess Grandmaster, and a member of an extraordinarily gifted family. I have written about them before. 1. I have been concerned that even the best journalists do not have access to some of the great research work that is going on right now, and which can have an immediate effect on the lives of millions of people. 2. Some of these new observations, research and treatment options languish in hidden corners, because they may not fit the prevailing medical model. The medical and scientific worlds are full of tales of first-rate research that got shelved because others could not immediately see its importance. There is a wonderful story of the way in which the German-born British scientist Hans Krebs was basically told, “Thanks, but no thanks,” when, in 1937, he submitted a short paper about his now famous cycle. Fourteen years later he won the Nobel Prize in Physiology or Medicine. 3. It is no secret that medical publishing and the award of prizes are tightly controlled by a small group of individuals. And it is right that extraordinary claims need extraordinary evidence. But when we have that evidence, it is only right and proper that you should have access to information that may help you. This blog is designed to be both a filter and a lens. 4. There is no longer any doubt that the laws of health and healing are changing. I doubt that you have heard that elsewhere, andyet the implications for your health and wellness are stunning. 5. Blogging is a medium through which non-professionals can contribute to discussions. I have already learned things from the experiences of people who have had to struggle with diagnoses and labels that hampered, instead of helped them. 6. I have had a great many discussions with fellow physicians and scientists about communicating science and medicine to the public. My own view is that the public is paying for our research and anything that we can do to empower people is all to the good. Yet many colleagues feel that any attempt to explain science in an accessible way somehow cheapens it. I think that they are dead wrong. I was already in medical school when Jacob Bronowski presented the Ascent of Man on television. Marvelous stuff that changed and energized my approach to medicine. If we do not explain the potential benefits of what we are doing to the public, then why should they, the government or pharmaceutical companies fund us? 7. Susan Polgar has reservations about the way in which chess is being taught, and I am concerned about the way in which medicine and science are being taught, particularly in the United States. Not that it’s bad or wrong, but just that it could be better and more patient-oriented. Chess Does Require a Brain! Whoever said that chess players are all geeks with no sense of humor, knew little about the real chess world. Yes there are some “unusual” people who play the game, but there are also a very large number of perfectly “normal” people who just enjoy the contest and all the benefits that it confers on our ability to think. As evidence of this, I saw an hilarious blog in response to my comments about unconscious thinking processes. With tongue firmly in cheek, the blogger asked whether the best way to prepare for a game was to have someone hit you on the head with a hammer before the start of the game, because I had pointed out the superiority of unconscious processing for some types of complex decision-making. Would that such an approach could raise my rating…. But sad to say consciousness is required for playing even a part way decent chess. Though here’s a thought, the next time that someone asks why we are “wasting time” on chess, tell them this: It is likely, though not yet proven, that chess may actually be one of the activities that not only stimulates the formation of new connections in the brain, but might actually stimulate the formation of new neurons in key regions of the brain. And if we play enough, we should eventually be able to do a lot of our processing below the level of consciousness. There is a nice article on Susan Polgar’s blog : Susan is the oldest of three remarkable Hungarian sisters who were trained to be geniuses from early childhood by their father László Polgár. She now lives in New York, and she is an International Chess Grandmaster who also happens to be fluent in seven languages. She is doing a great deal to promote the enormous benefits of chess, particularly in the United States. Clearly the sisters had “good genes,” but it is inspiring to see what can be done for youngsters if they are exposed to a highly enriched environment early in life. But there is something else to the Polgar story. Despite the stereotype that over-education might lead people to be unbalanced eggheads, all three have turned out to be remarkably normal and charming young women with children of their own. One sister – Judit – is the highest rated female chess player of all time, and the third sister – Sofia – is an International Master living in Israel. The normalcy of the sisters is in stark contrast to the situation of many children that I have seen in Japan, who are already having extra tuition in Kindergarten. Scholastic failure is a recognized cause of suicide in Japan, and the Japanese actually have a word for death from overwork: Karoshi. I wish Susan well in her efforts to promote chess, but I would also love her to share with the world how she and her sisters managed the balancing act of marrying extreme intellectual development with normal emotional and interpersonal relationships. That is in many ways even more remarkable than the sisters’ extraordinary accomplishments. There is a very interesting paper in this week’s Journal Science. It is from a group working at the University of Amsterdam, and their findings are likely to turn one branch of psychology upside down. Let me explain the importance of this work, and how you can start to apply it in your own life. What the researchers did was to divide their subjects into two groups. In the first experiment the subjects had to decide on a favorite car. One group used a conscious, intellectual reasoning approach and the other group was distracted with puzzles to keep their conscious minds busy before making the decision. When there were only four things to factor into the choice, the intellectuals did better. But when they had to choose on the basis of 12 factors the people using conscious decision-making did much worse than the people who had to make an immediate decision based on unconscious thought processes. In the second experiment shoppers were asked about their satisfaction with items that they had bought. People who bought on the basis of conscious deliberation were much happier with their choices of simple items, while the “unconscious” shoppers preferred their choices of more complex items. Why is this so important? Since the Enlightenment, science has emphasized the benefits of conscious deliberation in decision-making, and has tended to look down on the whole notion of unconscious thought. Yet this study adds to the growing body of evidence that not only can people think unconsciously, but that for complex decisions, unconscious thought is actually superior. Conscious thought is like a bright torchlight that can only illuminate a few things at a time, and that can lead to some aspects of a problem being given undue attention. This report supports something that many of us have been teaching for some time. Too much conscious deliberation can actually be counter-productive. Effective thinking needs us to get all the information necessary to make a decision. Then, if we are dealing with a simple decision use conscious thought. But if the decision is complex, it is best left to unconscious thought; in effect to sleep upon it. The answer then tends to appear very suddenly. There is a secret about the way in which a great deal of progress is made: Most of the major advances in physics have come not from logical progression, but from mystical revelation: Albert Einstein and the theory of relativity, Max Planck and quantum theory, Erwin Schrödinger and wave mechanics, the list is a long one. The great Welsh mathematician and philosopher Bertrand Russell once said of Einstein, that the problem in understanding him was not a difficulty with his logic, but with Einstein’s imagination. He was able to let his mind go to places that others could not, and it came back with answers that nobody else could have conceived of. There is evidence that while most chess players spend virtually all of their time trying to calculate, strong players rely on unconscious processes for most of the game, and only calculate for short periods when their unconscious mind tells them too. There is even evidence from brain imaging studies that average players activate all the cognitive areas of the frontal lobes while playing, with some temporal lobe activity as they try to remember their lessons. By contrast, a chess master uses many regions of his brain at once, and only occasionally activates parts of his frontal lobes when calculation is required. What this means for us is that we must not be afraid to turn complex problems over to our unconscious minds. I have also spent a great deal of time training people to get used to using their intuition, for this is really one aspect of what we are talking about here. In my book Healing, Meaning and Purpose, I have several sections on developing your intuition. 1. Once you have an answer, now is the time to use your conscious mind to see if the answer that you’ve come up with makes sense. 2. Learn to trust yourself. That may take a little time, but if you have a problem with trusting yourself, you have something tangible to work on. 3. Always be certain that you are prepared to hear whatever answers you receive. 4. Use your intuition to evaluate your intuitions: does the answer “feel” right? 5. Don’t force the process: conscious deliberation follows a linear time scale, unconscious thinking does not; so let insights come in their own time. 6. Always promise yourself that you will take action on any decisions that you make. Your brain and mind will not likely be very cooperative if you ignore the fruits of your unconscious thinking!